TruVision NVR 21 (TVN 21) is a robust high performance embedded network video recorder. Its TVN 21P line provides a 2U equivalent, offering up to 16TB of embedded storage. Having a total bandwidth of 40/80/160 Mbps available, the UTVN21Pis able to connect up to 8/16/32 IP cameras and provide real-time recording (25/30 fps) at HD720p resolution on all channels simultaneously. Furthermore, with its fully flexible bandwidth allocation, the UTVN21Pallows recording resolutions up to 5 MPX at various frame rates. To accommodate for TVN 21P’s 8/16/32 incoming IP streams, 16 TB of on board storage is available, using eight two TB hard drives. These hard-drives are front side accessible, allowing customers to easily expand storage as their system and/or requirements grow. Additionally, UTVN21Psupports extended external storage and backup via eSATA devices. Furthermore, UTVN21Pallows you to select from three recording modes; time lapse, event and alarm. These three can be used in various combinations, making sure data is stored in an efficient way as well as in a safe location. UTVN21P allows users full flexibility in the way they want to configure, manage and monitor their video surveillance solution. In addition to management of the unit through its browser interface or TruVision Navigator, the UTVN21Pallows users to also operate the recorder locally using its front panel controls, local VGA, HDMI and BNC outputs and its intuitive on screen display. 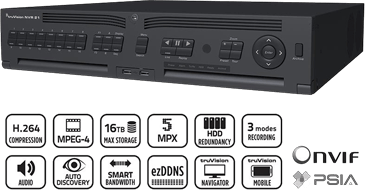 UTVN21P was designed to make system configuration and overall use easier for both the installer and end-users through features such as: ezDDNS, start-up wizards, plug & play hard drives, auto-discovery of natively supported cameras and most importantly, full compatibility with TruVision Navigator.